Throughout my web browsing/pinning, I've been seeing cute capes or cape-like jackets popping up. 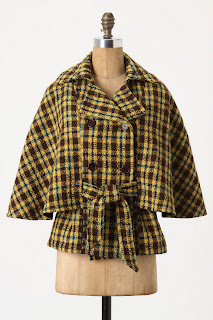 I have a few on my wish list to make, including the Anthropologie belted, plaid cape. So drool worthy. 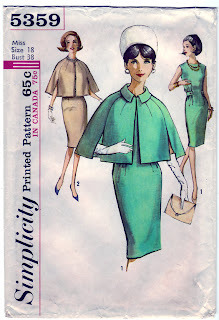 Anyways, I went on the hunt for a cape pattern and stumbled upon Simplicity 5359. 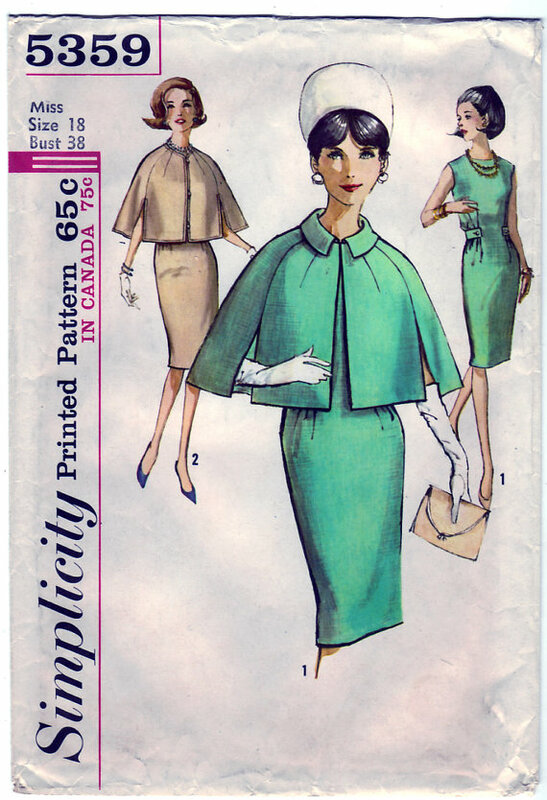 The pattern includes two cape options (one with a collar, one without) and a wiggle dress. I love the dress too, so I've put that aside for a future project. But I knew the cape would be perfect for a light, California fall day. I decided to go with the collared cape as I didn't want it to look like a poncho, and I like that it then became almost coat like. I used a brown wool for the outside and lined it in a light brown satin. My poor, sensitive skin can't handle the chafing from the wool, so the delicate lining was a necessity. I love how this turned out! It's so simple but adds a nice elegant touch to my Fall dresses. I only received on 'you should be carrying as basket of apples' comment, and only in jest, but many compliments on my little cape. Notions: Bias tape for a loop closure at the neck and a little hook and eye closure for extra security. The pattern was so easy to put together and just a few pieces overall. I had to do a bit of trimming at the collar area of the selvage as it was getting really thick with the wool, and then I under-stitched it to keep it in place. I also did top-stitching around the edge of the cape, because I liked the look and it helped to minimize the bulk and the fabric shifting around. I would love to make this again if another fabric 'called out' to me. In the meantime, I'm on the hunt for a pattern similar to the Anthropologie jacket. That can be my 'late Fall' project. Beautiful job! You look lovely in it, too. Really like it. Very pretty! You look lovely in it. I really like watching what you make. I wasn't so adventrous(sp) in my sewing. I LOVE this cape so much! The length is just right and I love the arm holes! Great job and fabulous staple Autumn colour! This is just fabulous! I hope you get to enjoy wearing it a lot and find some more perfect fabric! I'm in love with capes and agree, I see them everywhere and the anthro cape is very drool worthy! I love your cape and how adorable it looks with your cape! 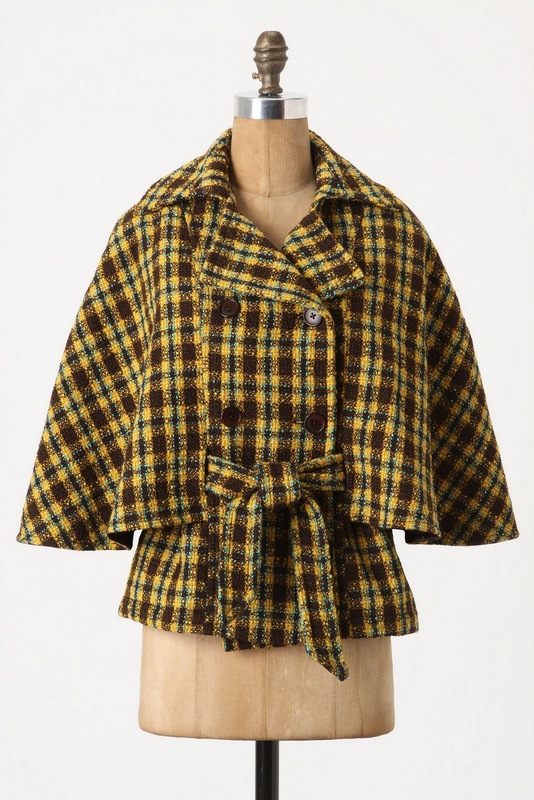 This is gorgeous, I have been looking for a cape pattern because i have just bought some lovely wool/tweed fabric thats just crying out to be a cape. But I was also like yourself wanted to stay away from 'poncho like'.As for the plaid cape style have you seen Mcalls 5764. Oh that is so pretty. You do look nice in it. Because of you, now I am thinking if there's a cape pattern somewhere that I might have. Wow... I now wish I had this pattern! It looks so great on you. It does really look like a coat in one of the pictures, which is really awesome! I'm going to have to go look for this kind of pattern now!